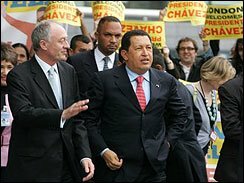 "Venezuela's President Hugo Chávez, right, receiveds a warm welcome in London on May 15, 2006. He's waling with the city's mayor, Ken Livingstone." The USA Today's headline, "Chávez: Hero, Prophet Or Tyrant?" That common man's appeal comes largely from places like Venezuela's ramshackle barrios, where the poor and desperate live. About 80 percent of the population here is poor and makes up most of Chávez's political support. And no wonder. In this neighborhood Chávez is giving away land — promising to build three-bedroom homes to replace shacks like the one Nellie Escalona lives in. Asked how she viewed Chávez, Escalona says, through a translator, "He's a good President. No other President has done what he has done." In this town, high in the Andes, Chávez has supplied doctors for the first time in a deal from Cuba, another thorn in the U.S. government's side. Chávez made a swap with Fidel Castro: He offered Cuba cheap oil, in exchange for some of Cuba's doctors — like Niuris Mereno, who thinks the deal is working. "Some of these people," she says through a translator, "have never seen a doctor before." Chávez has also created a system of government-run food stores — where staples like rice and beans now sell for 50 percent less than the market value. And in schools — where students used to go only for half a day — most now attend all day classes. There they are provided lunch along with literacy. All sound too good to be true? It's so intriguing that some Americans are coming to see it out for themselves — as tourists. Vick Vinkey came from Rochester, N.Y. to investigate. "I came here to find out what's happening with what seems to be a massive social experiment." Yep. As I suspected. He's almost godlike.